The feast of the Entrance of the Theotokos is called by my fathers on the Holy Mountain "the monasticism of the Panagia" (η καλογερική της Παναγίας). Elder Gelasios loved her very much and would say that Papa-Thanasi, his Elder, the holy abbot of Gregoriou, honored her very much. And on one such day Elder Gelasios saw my Elder co-liturgizing with Saint James the Brother of God, who preserved this tradition. 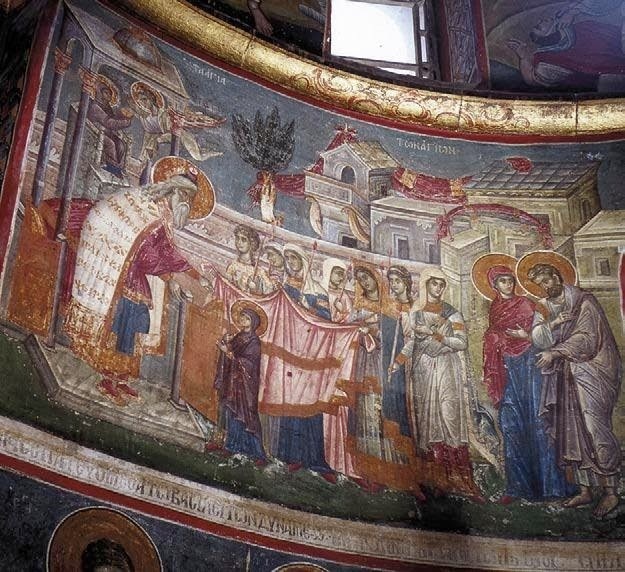 The Panagia enters the Holy of Holies. Her parents, our grandparents Saint Joachim and Saint Anna, fulfill their vow. Many young girls of Jerusalem hold lit lamps and open a red cloth, like the bridal cloth that would be put on the backs of couples in olden times at the time of the celebration of the sacred mystery of Marriage. How many symbols! And how many centuries has the world waited for this hour! For the Ever-Virgin to enter into a prepared place, where male high priests trembled to approach and enter once every annual cycle. It is impossible for the mind to comprehend, and many "scientists" deny this feast in particular. But of course they will deny it, since they live by logic-bound thought. And wherever "irrational" logic enters, the supra-rational Mind, our Triune God, departs. And the archangel of joy, of the gospel and of hope serves her. What a fearsome mystery! The Athonites associate this great feast with monasticism, with the mystery of the monastic state. Certainly the place of our holy of holies is a place deep in our hearts. It is where the mixing of the created and the Uncreated takes place, in complete light. When the heart is completely empty, it is renewed by the Young Child, our Lord Jesus Christ, in complete and salvific light. Empty is the sacred sanctuary of the Temple of Jerusalem, and enthroned there is little Mary, the child of Nazareth. The monk, the beautiful old man, is he who enters his own sanctuary, when he forgets and leaves. And, what a mystery is this, when he makes the little Virgin turn back, he gets excited by the light and the red color that shines in the light, and he rushes forward again, to his sacred bridal chamber, his unique and only place of rest, deep within the heart. And there are tears. The monasticism of the Ever-Virgin! The great high priest and prophet grants her entrance. Yes, he is even a prophet, for him to know how many centuries the prophets before him prophesied of this moment. The message of the prophets, is the Lady Theotokos. It is spoken about also in the troparion. And the renewal of the faithful; we, that is, who want to be faithful to the faith and faithful to the Church, we are reconstructing-changing, and every moment we become, if we want, new again: we are filled with her light and believe correctly in the Church. As an Athonite, how much did Saint Gregory, the Theologian of the Uncreated Light of our God, love this feast? His homily on it is unlike any other. Pure excitement, waves of grace and an ocean of love. My brother, if you find yourself at Hilandari, our beloved, lift up your eyes above the right choir, and dance with the monks; see the company of little Mary and her parents and the high priest. Look, and be excited. And you also will live, even for a short time, inside the holy of holies of the cosmos, this false world, on sacred Athos, her Garden, the Holy Mountain. And remember, the Lady Theotokos is our renewal.